Creating a special environment to make your yard more versatile and "user friendly", doesn't have to be a daunting experience. You'd be surprised what a little imagination and forethought can accomplish! For instance, a small, sloping yard may be a bit of a challenge when it comes to designing the landscape and utilizing space. But a latticework privacy fence that doesn't block air flow, and lets in light and depth from beyond the yard's perimeter will make it feel larger than it really is. A well-planned deck with stairs leading to a higher level increases space available, changing a narrow, sloping yard into a welcome haven with interesting contours. The upper deck will act as a canopy to the space below, which can be utilized as an enclosed storage area, a place to enjoy B-B-Qs, or a play area for the children. A monotonous large, flat yard can be turned into an oasis of beauty by creating an island of green to be used as a sitting room. Define perimeters of the grassed sitting area with towering drifts of perennial and annual flora. Delphiniums, Canterbury-bells, foxgloves, poppies, lupines, coreopsis, daises, and black eyed Susan. Create an aromatic arbor of honeysuckle or jasmine, or tufts of ornamental grass for the entry. Select colorful outside furnishings, or wicker furnishings with colorful pillows and cushions, for the center of the sitting area. The addition of a bird bath off to one side, or a small garden pond with trickling water, will entice wildlife and add to the overall sense of serenity. Incorporating a narrow porch as part of a larger patio will not only increase lounging space, but provides a covered area that will lend respite from the sun and weather elements when needed. A bi-level deck is great for a small back yard, and forms an ideal frame for a hot tub, a built-in garden pond, or sand box with a patio umbrella for the children. A round picnic or patio table placed at one end requires little space. Flower beds filled with fragrant herbs and tubs of cherry tomatoes and other small-type garden plants can utilize "too-small-for-anything-ealse" spaces. They will also add charm and color, and offer culinary gifts to enhance backyard dining. Including a built-in pit at one end will provide all the fun of a campfire, and enough smoke to discourage pesky bugs. It will also create just the right amount of light for romantic evening dining, and heat for cool evenings. Whatever shape and size yard you have, carefully plan out how you want to utilize space and landscape the yard. Ask yourself what main purpose you would like the yard to serve: a play area for children, a private place to rest and relax, a place to entertain, a haven for wildlife, a delight for the senses filled with beautiful and fragrant flora, or as garden space for healthy, organically grown vegetables. Be sensible. Weigh your family's wants with your family's needs. Consider also the needs of any pets. Dad might want a mini putting range, and you may have dreamed of a huge garden pond filled with Koi carp for years. But if space is limited and you have a large outside dog, or small children that need a safe area for outside play, a putting range or large garden pond might not be practical. Look at your yard critically; make a list of good points and bad. Study your yard at different times of the day. In the morning just as the sun comes up, in the afternoon, and in early evening as the sun descends. Does your yard get enough shade, or too much? What about privacy? Is the yard so open it gets too much wind? And what about when it rains; do areas of the yard collect excess water? Each alteration to the yard should serve as an improvement, not one simply for the sake of change. Whether to solve a problem, or to accent a good feature, plan the purpose of each modification carefully. For instance, entrances to and from the yard should be designed with ease and convenience in mind. 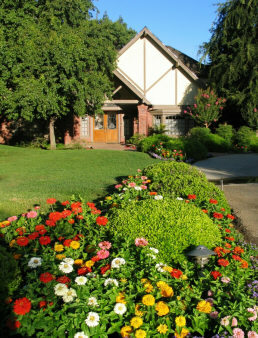 Trees should be planted to improve the yard visually, as well as for shade or privacy purposes. Get landscaping ideas by talking with other homeowners. Drive around your neighborhood and other areas to see what you like, and what might work in your yard. Browse through landscape design books and magazines. Utilize the features and aspects of those you especially like by incorporating them into a design that works best for you. Remember to check building codes, deed restrictions, and any other laws pertaining to landscape alterations early in the planning. Know exactly where your property line begins and ends, and find out what the setback and easement regulations are. But most of all, dare to dream. With careful planning and forethought, you really could have the kind of yard you've always wanted!